Companies are focused on creating an inclusive culture. But there are areas which are proving difficult to tackle because, much like unconscious bias, they happen outside of awareness. Micros-behaviours were first researched and written about by Mary Rowe, a professor at the Sloan School of management at MIT in 1972. She described them as “micro-inequities” and acknowledged that victims, bystanders and leaders alike find it hard to identify them. 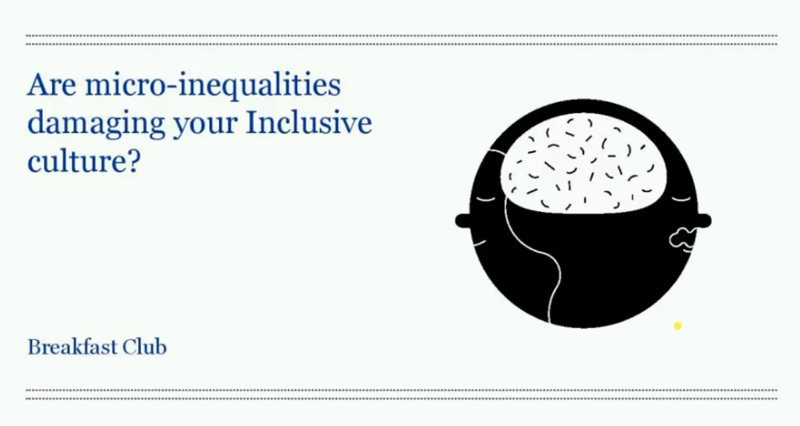 When the targets of micro-inequities do recognise the micro-messages, they find it’s exceedingly hard to explain to other people why these small behaviours can be a huge problem. Because they are small behaviours: it’s easy to belittle their effect. So how do you help leaders recognise and manage their own micro-inequalities and use more micro-affirmations? This was the topic for our December Breakfast Club.